Haven’t decided on a hotel yet? You can look at other available hotels in the regions of Upper Austria and Lower Austria with Booking.com. Through the heart of these two provinces flows the inspiration for some of the world’s most sentimental music and literary compositions, the beautiful blue Danube. As an important link between eastern and western Europe, control of the river was hotly contested for centuries. Fortified castles, abbeys, and monasteries abound from the hilltops, each with a story to tell of marauding Turkish invaders, of robber barons who would imprison and torture those who would refuse to pay the outrageous river tolls, and of the capture and ransom of King Richard the Lionhearted after the Third Crusade. Pages from a fairytale book unfold at every bend in the river. 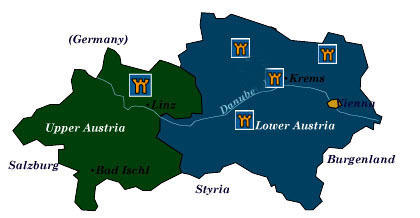 Lower Austria (Niederösterreich) surrounds the federal capital of Vienna. The province’s vineyard-carpeted hills, majestic Benedictine abbeys, medieval castles, boat trips on the Danube, and elegant old spa towns are all easily accessible on day excursions, but you’ll find the most rewarding experience is basing yourself outside the cities (at a castle hotel, of course) and making excursions from there. The greatest attraction in Upper Austria (Oberösterreich in German) is the gorgeous region of the Salzkammergut, with its pristine lakes set against grand alpine peaks. Further afield, you’ll find lovingly restored baroque abbeys and pleasant, reasonably priced towns. Wachau Valley is the most enchanting part of the Danube. Rolling vineyards, fragrant apricot orchards, and the picture perfect town of Dürnstein have made the entire region a UNESCO World Heritage Site. Time your visit right by arriving in romantic style on a paddlewheel steamer from Vienna. Melk Abbey Perched high on a bluff overlooking the Danube, this magnificent and dramatic baroque monastery was built in the 11th century, almost destroyed by fire in 1297, besieged by Turks in the 16th century, and gloriously rebuilt. Wienerwald Known as the fabled Vienna Woods in English, numerous hiking and cycling trails cross through pleasant forests just to the west of Vienna. Towns well worth a visit include Baden, an elegant spa town where Mozart, Schubert, and Beethoven (who wrote much of the Ninth Symphony here) composed; Gumpoldskirchen, famed for its white wine; and slightly further out, Klosterneuburg, home to the baroque Augustine abbey, Stift Klosterneuburg. Heurigen Identified by a green wreath or branch hanging on the front door or gate, these rustic wine taverns serve their own home-pressed vintages. Food is also offered, which you select from a hot and cold buffet counter. When the weather is fine you can toast and snack to your heart’s content into the late evening hours. Castles, burgs, and schlosses everywhere and not enough time to visit them all. Some of the most intriguing are: Burg Aggstein in Schönbühel, Burg Hinterhaus in Spitz, and Kuenringerburg in Dürnstein. Just south of Melk is the remarkable Renaissance castle-palace of Schallaberg. Salzkammergut Famed for its 76 lakes, each with a charming and picturesque village resort on the shore and a panoramic mountain backdrop, the Salzkammergut stretches across three provinces: Upper Austria, Salzburg, and Carinthia. Salt mining brought the area riches, and Habsburg Emperor Franz Josef I established the area’s popularity with Europe’s aristocracy and artists in 1854. Two of the must-see towns are Hallstatt (with a history that spans over 4500 years, Hallstatt is a UNESCO World Heritage Site) and the utterly lovely Gmunden, known for its ceramics and lakeside castles. St. Florian The Augustine abbey of this town in Upper Austria dates from the 9th century and is considered one of the finest baroque buildings in Austria.